Arrive Luang Prabang Airport. After meeting your guide you will begin a half-day tour of this wonderful World Heritage town. The tour is nestled in a beautiful setting surrounded by lush mountains, this sacred city offers endless opportunities for sightseeing. Today you will visit a number of different Wats and other interesting sites.In the afternoon you will have some free time to recover from your journey and to begin exploring further on your own. Today you have a city tour of Hanoi which includes Hoan Kiem Lake and Ngoc Son Temple which are located in Hanoi's Old Quarter. After a break for lunch, we visit the Temple of Literature. The temple was built in the 11th century and was Vietnam’s first university. You'll also visit the Fine Art Museum and Quan Thanh Temple. This morning you will have the option of starting early to take part in the traditional Lao Rite of giving alms to the monks. 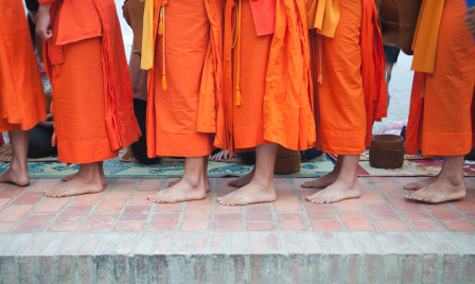 Each morning, around 300 monks walk through the streets to silently collect offerings. After breakfast in your hotel you will travel to the stunning Kuang Si Waterfall. You'll see the falls cascading over numerous calcified tiers and down several hundred feet into a series of turquoise pools. If you feel like cooling off you can take a swim before we return to Luang Prabang. A local lunch is included before returning to your hotel. The remainder of the day is free. After breakfast at the hotel, your guide will take you to the mysterious Plain of Jars. After time exploring the Jars you'll visit the Old Town, the stupa and temple at Muang Khoun. After a local lunch you'll return to your hotel. Today you have a 6-hour picturesque drive to Vang Vieng, where you'll have stunning views around almost every turn. In the afternoon you'll have plenty of free time to relax on the scenic banks of the Song River or explore the lovely town. You have a free day in Vang Vieng today to explore at your leisure. You'll have options to go inner-tubing, kayaking, caving or even just relax and take in the beautiful views. Overnight in Vang Vieng. Today begins with a three hour drive to Vientiane. After arriving you'll visit Wat Sisaket, which has thousands of miniature Buddha statues which you will see. Today you'll also visit many other interesting sites and monuments.Overnight in Vientiane. You'll start today with a very early breakfast before transferring to the airport for a flight to Pakse. After arriving your adventure will begin with a relatively easy four-hour hike up to the Bolaven Plateau. Along the way you'll pass through local villages, coffee plantations, over a hanging bridge, and on to the plains. In the afternoon you'll return to your hotel for lunch and the rest of the day is free to explore Pakse. This morning you'll journey south south to visit the famous Khmer Temple complex of Wat Phou. This UNESCO World Heritage Site represented the easternmost border of the Khmer empire. Leaving the temple behind you'll head to an Elephant Camp to see how the Mahouts train these friendly giants. You'll also have the opportunity to take an Elephant ride to the top of Phou Asa to see the ruins there. After a break for lunch, you’ll continue to 4000 Islands by van and boat. The section of the Mekong which you'll visit today runs through southern Laos and boasts thousands of tiny islands. In the morning you'll visit Asia's largest waterfalls - Khone Phapeng & Li Phi Falls. If you’re lucky enough, you may see one of the Irrawaddy (freshwater) dolphins that make 4000 Lakes their home. Spend the afternoon relaxing or exploring an island on your own. After breakfast you'll be transferred to Pakse Airport for your departure flight. As all flights into Laos operate via another Asian country (connections aren't always ideal), we are able to organise extra nights in Thailand, Vietnam and Cambodia if required.